Greg Valentine is the average example of a wrestler type which doesn’t exist anymore. His look, his style, and his aggression were very prevalent in wrestling in the 1970s and 1980s. Every territory had its own Greg Valentine. He was a bruiser. Where did it go and why? 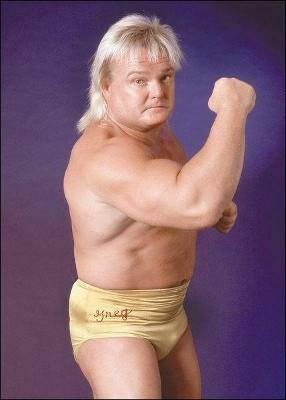 Take a look at Greg Valentine in his prime. Almost no muscle and thick. Compare him to an average wrestler today. Does Randy Orton remind anyone else of Ryan Gosling? Valentine looked out of shape. He had “retired football player” all over his body. And this was totally acceptable. This 1970s look existed almost until the 1990s. Harley Race, Pedro Morales, Johnny Rodz, and Blackjack Mulligan are just some of the Hall of Famers with a similar look. He kinda looks like your uncle. Or what you would expect the gym teacher to look like without his clothes on. George Steele actually led a double life and WAS a gym teacher most of the year in the 1970s and even today. This look doesn’t exist anymore. All the stout wrestlers either took steroids (ala Hercules) or realistically just stopped joining the business. WWE gave stout wrestler Husky Harris a great deal of flack for his weight, moving him back to NXT, (where he is super as Bray Wyatt) Fellow husky brawler, Trevor Murdoch, never really succeeded. Valentine was also very slow and methodical in his wrestling style. No star today can get away without spots. Antonio Cesaro lifts a man on his knees in an impressive feat on strength. But its purpose is to show and not tell of Cesaro’s strength. Valentine had no such moves. His strength was built up by announcers and more by his look. He looked like a guy who may get into a bar fight. It takes 35 seconds for anything but a punch to happen in this match. This all stemmed from his bruiser image. The bruiser in wrestling had a hard nosed, more punches and kicks style that is considered today to be the example of a bad wrestler. But it was very common. And truly many many wrestlers of the 1970s were fit, generally able to last long matches which would be hour draws where nothing really happened. Valentine was good at this. Now when looking at his career, Valentine had much mid-card success in a couple of territories. He had a successful NWA Tag Team championship reign with Ric Flair. His dog collar matches with Roddy Piper over the United States Championship were brutal and great brawl matches. Blood Blood Galore. But overall, Valentine’s success came from a good business decision. In 1984 Valentine returned to the WWF on a hunch. He supposed that the national expansion of the WWF would be successful. Have this guy on your side at the racetrack. Valentine was rewarded with a long intercontinental reign in 1985 and was spearheaded an a real tough man. Greg embraced his Hammer moniker with impressive results. Valentine retained at Wrestlemania 1 over hot as ever Junkyard Dog before losing the IC title back to Santana in a vicious cage match. Valentine then held the tag team championship in the old couple like Dream Team with Brutus Beefcake. This was 1986. 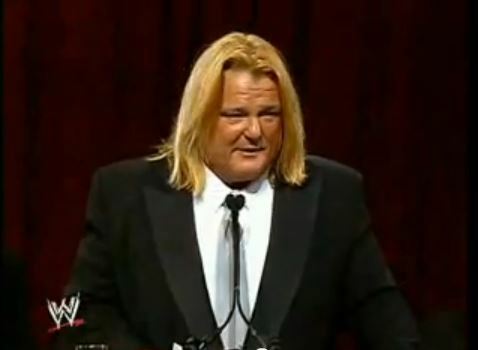 This caps off any large success Greg Valentine had in his career. He stayed in the WWF until 1992 and was never treated to any other title success of main event feud. This is due to Valentine’s inherent problem. He had a general lack of charisma. He always needed a manager. Jimmy Hart, and Johnny V were paired with Valentine most of his run in the WWF. He couldn’t cut it. Both literally and figuratively. I do believe that this is probably the most unitentionally racist promo I have ever seen. He didn’t try to be racist. Valentine spent the rest of his WWF career spinning his wheels as part of Rhythm and Blues or being paired up with other brawler types like Ronnie Garvin and Jim Duggan. But as wrestling became WWEized and more cartoony, Greg Valentine lost his place. 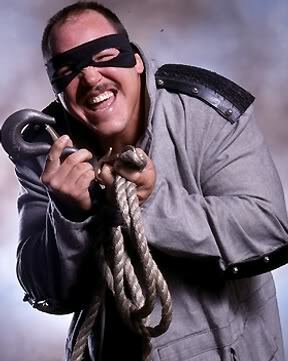 He was a man of a previous generation and didn’t work in the bright light atmosphere of Repo Man or The Undertaker. Valentine faded from there, bouncing around from WWF to WCW and eventually to the independents. Valentine is a wrestler who feels like a relic. A relic of a time where stocky men in tights beat the every loving crap out of each other. That whole thing looks painful. 2004 was the re-introduction of the WWE Hall of Fame. 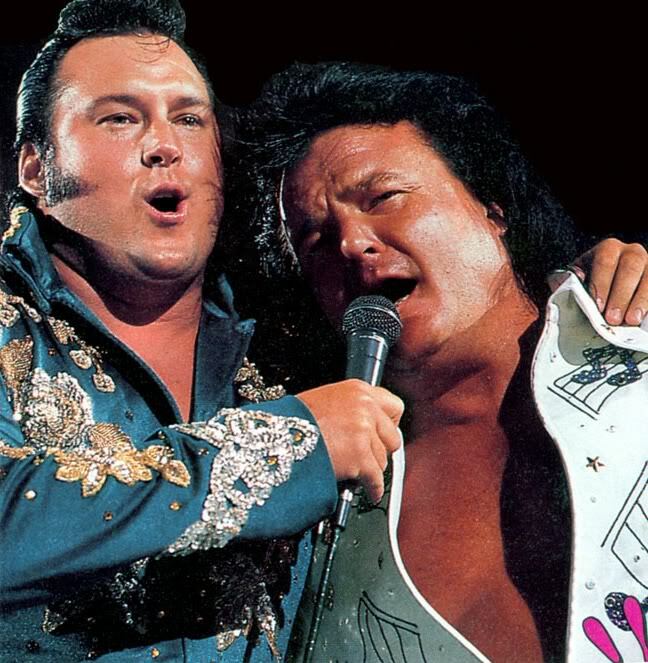 For this, they decided to go with wrestlers who were important to the early 1980s in WWF. And almost all of them did that (not PETE ROSE!!!) Valentine fit mostly as well. He gave most of his career to the WWE. Valentine was there for over 12 years. This good hand type is a very common occurrence in the WWE Hall of Fame. Valentine was appreciated for his dedication. Valentine is acceptable and memorable. That’s it really. Plus he did this. He can’t speak so his acceptance speech would be boring. It was boring. This entry was posted in 6 out of 10, Class of 2004, WWE Hall of Fame and tagged greg valentine. Bookmark the permalink.